Kiwi sporting fans hang on every word their All Black coach says, as a winner of the Rugby World Cup, six out of seven Rugby Championships, and an 88.5 per cent success rate. It’s also a given Hansen knows how to rattle Wallabies coach Michael Cheika. What’s not a given is how much better the Wallabies will play in this Rugby World Cup year under new director of rugby Scott Johnson, and a third selector who is yet to be named. Cheika’s sole selection and sole control status is gone. If the selections are right, the basics of pass, catch, support, retaining possession, and tackling are raised, and the subsequent tactics are improved as well, Hansen knows Australia will be as big a threat to his team making it three World Cups on the trot as Ireland and England. So when asked at a Wellington fundraiser if Mickey Mouse could coach the All Blacks, given the huge depth of talent, the wily Hansen saw the perfect opportunity to fire an early shot across the Wallaby bow. “Mickey Mouse coaches the Wallabies,” was a bullseye. With no June window in 2019, that sledge will be hard to beat in the lead-up to Australia’s first international of the year, against the Boks at Ellis Park on July 20, before facing the Pumas in Sydney on July 27, and the back-to-back clashes with the All Blacks on August 10 and 17 in Perth and Eden Park – all before the World Cup kick-off in September. Two intriguing questions have yet to be answered – will Stephen Larkham, the flicked assistant and attack coach, be replaced, and who will be in the coaching box from now on? Will the new director of rugby and the third selector? If they are, there’s every chance Cheika’s explosive nature will be controlled, which will be beneficial to clearer thinking over both the 80 minutes and the media conference post-game. 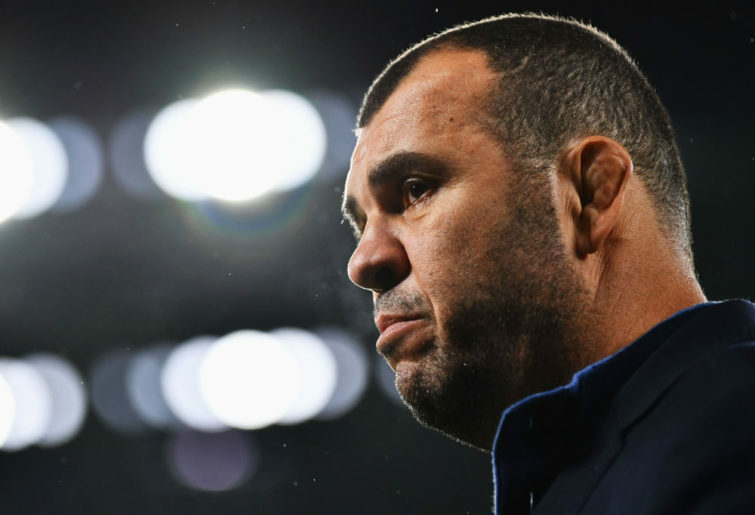 Let’s face it – Cheika was an explosive player, so it stands to reason he’d be the same as a coach. Whether or not the latter is in the best interests of the Wallabies could be debated for hours – he is the coach until the World Cup’s completion in October. How he handles having his wings clipped, how he handles the intrusion of Scott Johnson and the third selector on his once exclusive territory, and how he handles the inevitable future Steve Hansen sledges can only be answered down the track. There’s one more given – three making decisions sure beats the daylights out of a one-man band.